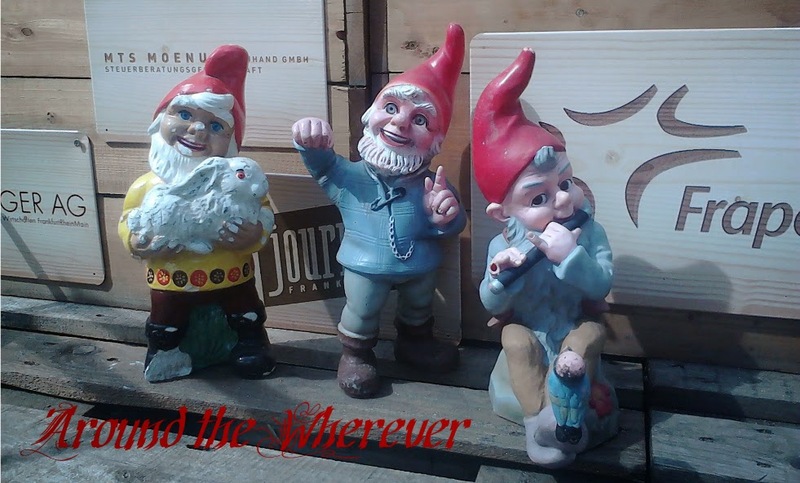 Around the Wherever: My week: August 16 ed. I did quite a bit of lounging around this week because the week before was the huge event at work that I had organized. In between the lounging, I got out and foraged tons of blackberries. I have several patches that I visit and they're just bursting with fruit. My freezer is doing the same now! 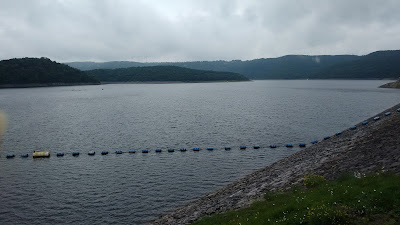 -I drove to the Rursee this weekend, which is located in the Eifel region of Nordrhein-Westfalen, about 2.5 hours north of here. I visited a friendly acquaintance, B, and her husband M. I had been really looking forward to some boating and perhaps some swimming. We had some hot weather leading up to the trip but didn't it just figure that by the weekend, it was cold and intermittently rainy! I wasn't going to bring my jacket but grabbed it at the last minute, which was a wise decision. Don't get me wrong; I like cooler weather but it was such a tease during the visit where I had intended to make full use of the lake. Upon my arrival, I met M, B, and two of their friends who'd been visiting. The friends were a German and American couple. I was excited to find out that the husband is an apprentice carpenter because I wanted to pick his brain about how to host one of the Wandergesellen, or wandering carpenters. It's an old tradition where some choose to wear Tracht and wander for a time following their training. They offer to do some work around a host's home in exchange for lodging and food. I thought that it was a cool idea and would love to host someone like that and hear his stories. B's guest didn't know anyone personally but mentioned that there are websites where one can try to find the wanderers along their routes. Maybe that will be one of my goals: to find one of these wandering carpenters so I can grill him learn about his travels in the pursuit of Knowing More Things. After a pleasant lunch, the other guests left. B took me for a walk through the area. 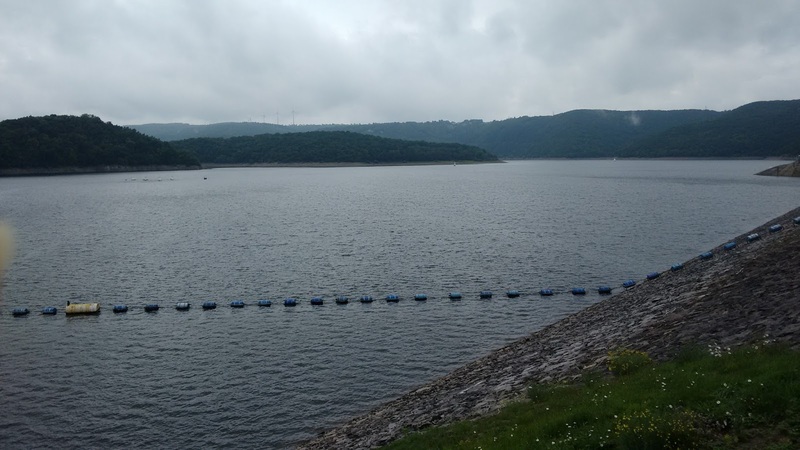 The Rursee and Eifel region is beautiful; mountains and lakes/reservoirs snake through the area and the Eifel was recently made into a national park. Opportunities for outdoor pursuits such as camping, hiking, bicycling, and boating draw people to the area. We visited downtown Simmerath where elderly Germans, kitted out in Jack Wolfskin and other weather-suitable attire, bustled by, using their walking sticks to propel themselves through the light crowds. We even saw some Turducken Thingies! I had to tell my silly story of my first time seeing Egyptian Geese in Amsterdam. It dawned on me that calling them Turducken Thingies is not really accurate because they're more like Gucks or Dugoos since it's not incredibly apparent whether they're geese or ducks. On our way back, we heard music and saw a beer stand set up in a courtyard of a kindergarten. I absolutely had to know more about this so B agreed to go inside. 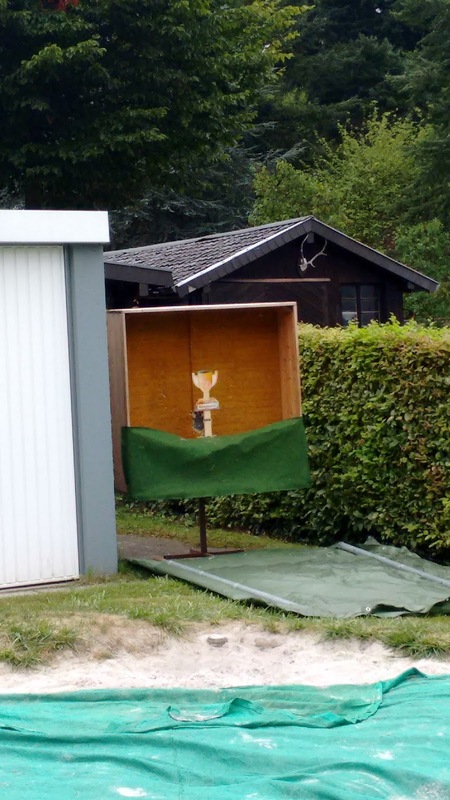 The Schützenverein, or shooting club, was having a celebration during the weekend. I drank some water and B had some beer. 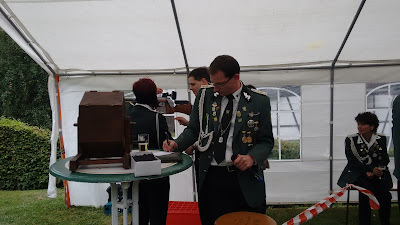 Neither one of us had to pay since apparently the Schützen König (king) was buying everyone's drinks that day. It's part of being king, I guess. I'd certainly join that kingdom! 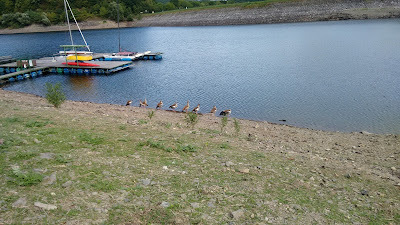 The next day, we took a boat ride around the Rursee. Even though M and B have lived in the area for years, they hadn't taken it themselves yet. 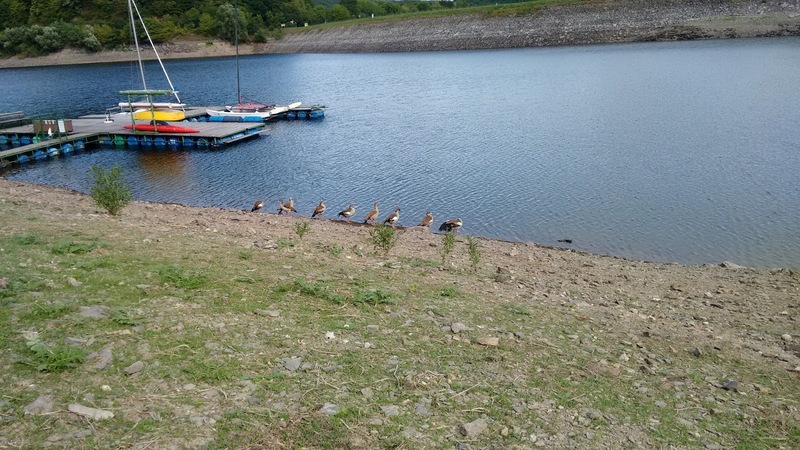 The ride ended at the dam, which was near a Dutch-held campground. That put me into a fit of giggles as I wondered if they had brought enough toilet paper and supplies from the Netherlands (or didn't ahead of time, and bought them in Germany since it's cheaper here). Thank you, Stuff Dutch People Like, for letting me know the ways of my kinsfolk. A view from the dam. There were birds on the barrels but they weren't Turducken Thingies. On the way back from our Schifffahrt (hehe - and isn't that a ridiculous number of f-s? ), we came across a jolly good time at the Schützenverein's celebration and of course we had to stop. 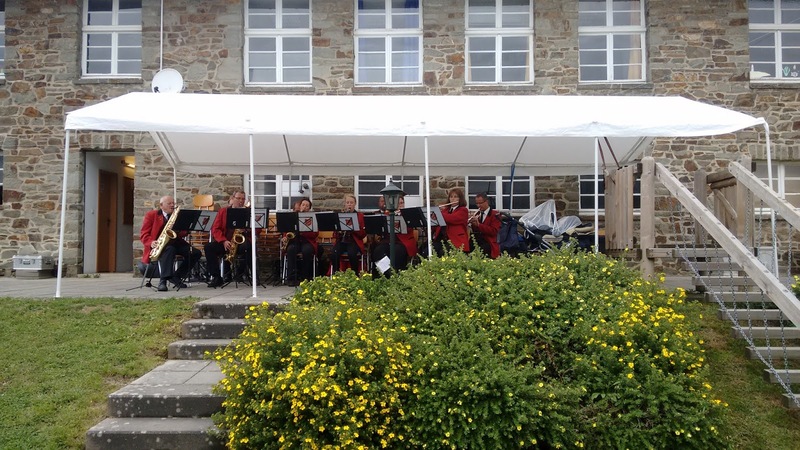 The brass band played, people drank beer, and people prepared to shoot a gun. Yes, you read that right: the Verein was having a shooting tournament in the courtyard of the kindergarten. For the record, school wasn't in session and the gun was an air rifle, mounted on a stand and directed at a (reasonably) well-insulated target on a stick. It didn't seem as if too many things could go wrong, despite the drinking. A target on a steeeeck! I'm in no way into guns but in a relatively safe environment with a gun that would cause minor damage, I was cool with that since I believe that it's important to embrace new experiences. I also don't drink beer so that makes things slightly more safe. I signed up to shoot and took my turn with the others. I was the odd one out because I wasn't drinking a beer in between the rounds; it seemed as everyone else was, and once in a while they'd put forth a jolly prost-prost-prost type of cheer. I always love me a good party atmosphere and this was perfectly wacky enough. I mean, the Schützenverein is located in the basement of a kindergarten where they shoot inside during inclement weather, for goodness sakes! Who thinks that is a great idea? Look at all that flair! I did think that everyone's uniforms were cool. They had all sorts of pins and medals and stuff (S from work called it "flair"). I've been to an actual Schützenverein lodge in the Pfalz forest by my house once. It was kind of not on purpose (okay, totally not on purpose; R and I got lost on a bike ride) and there was a creepy jackalope on the wall and a general Deliverance type of vibe as we purchased our drinks. Despite that, and despite my feelings of ambivalence bordering on not liking guns, I have to say that I'm a bit intrigued by the concept of a Schützenverein. Since they wear unusual costumes, prance around, listen to brass bands, and shoot at pieces of wood, I must admit that it's a bit intriguing. With these thoughts swirling around in my mind, I soon said goodbye and thank you to M and B for the lovely weekend.